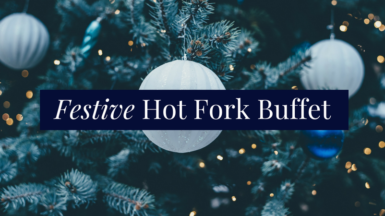 Throughout November and December, upgrade your meeting or event, and add some festive cheer with our Christmas Hot Fork Buffet! Our menu features a delicious range of seasonal dishes with festive flavours. Simply enquire with our events team about upgrading your meeting, conference or event for the Christmas period. please select one meat main, one vegetarian option, two sides and one dessert. Served with a selection of fresh bread. Turkey, Cranberry & Leek Pie diced turkey, with fresh cranberries and sautéed leeks in a rich thyme volute and topped with puff pastry.